The Hampshire Council of Governments is a voluntary association of cities and towns and the successor to the former government of Hampshire County, Massachusetts, that was abolished in 1999. A body politic and corporate, its charter ratified by Massachusetts General Law 34B, S20(b), the Council oversees roadways, the electricity supply, building inspection, tobacco control, cooperative purchasing, and other services for member communities. The Hampshire Council collection contains a dense record of county-level governance in western Massachusetts from the colonial period through the mid-twentieth century with extensive documentation of the actions of the County Commissioners, and before them the Court of Common Pleas and Court of General Sessions. Rich in documenting the development of the transportation infrastructure of western Massachusetts, the collection offers detailed information associated with the planning and construction of highways, canals, ferries, and railroads, but the early records offer a broad perspective on the evolution of the legal and cultural environment, touching on issues from disorderly conduct (e.g., fornication, Sabbath breaking) to the settlement of estates, local governance, public works, and politics. From the mid-1630s, European settlement of western Massachusetts progressed northward up the Connecticut River Valley, spreading gradually to the east and west. Under the authority of the General Court in Boston, Hampshire County was established in 1662 with courthouses in the two largest settlements, Springfield and Northampton, assuming jurisdiction over most of the current-day Commonwealth west of Worcester. Civil authority was administered through a three-tiered system in which magistrates (later justices of the peace) dispensed justice at the local level, above which sat a system of county-level courts and the General Court and Court of Assistants in Boston (later the Governor and Council). County-level courts bore much of the responsibility for regional administration, ranging from laying out highways, roads, ferries, dams, and bridges to licensing taverns, inns, and retailers; keeping jails; and maintaining local order. Civil suits exceeding 40 shillings but less than ten pounds were heard in the Inferior Court of Common Pleas, while the Court of General Sessions, composed of a quorum of local justices, heard most non-capital criminal cases. For more serious crimes, including capital offences, cases were referred to the Superior Court of Judicature, a circuit court established in 1692 that met in each county as designated by the legislature. As the population of western Massachusetts increased, Hampshire County was divided several times into smaller, more manageable bodies. The eastern part was separated out as Worcester County by act of the legislature on April 2, 1731, followed by the separation of the west into Berkshire County on April 21, 1761. Sandwiched in between Worcester and Berkshire, the remains of Hampshire County were further divided horizontally into thirds, with the northern portion becoming Franklin County (June 24, 1811) and the southern, Hampden County (Feb. 25, 1812) in which Springfield served as county seat. The political evolution of the Commonwealth led to other changes in the system of county courts and administration, particularly after the state constitution of 1780 mandated a complete separation of legislative, judicial, and executive functions. In 1821, Massachusetts established a state-wide Court of Common Pleas and within three years, all judicial powers of the Court of General Sessions were transferred to that Court and the administrative powers were delegated to a newly created body of County Commissioners and Commissioners of Highways. After the Court of General Sessions was abolished in 1827, the County Commissioners in Hampshire County assumed responsibility for the administrative functions of the General Sessions as well. Ultimately, the Court of Common Pleas was abolished altogether during further reorganization in 1859, with most of its trial functions delegated to the new, state-wide Superior Court. By the last decade of the twentieth century, many county governments had become little more than vestiges of their former selves, with judicial and administrative functions having been absorbed by operations of the towns or by the state government. When Middlesex County reached a point of near insolvency in June 1997 and dissolved, it set off a period of three years in which eight of the fourteen county governments in Massachusetts were laid down and others were substantially reorganized. Hampshire County was officially abolished on Jan. 1, 1999, and many of its responsibilities were reorganized under the Hampshire Council of Governments as a voluntary association of cities and towns. Chartered under Massachusetts General Law 34B, S20(b), the Hampshire Council is a body politic and corporate that oversees basic services for its member communities, including roadways, the electricity supply, building inspection, tobacco control, and cooperative purchasing. 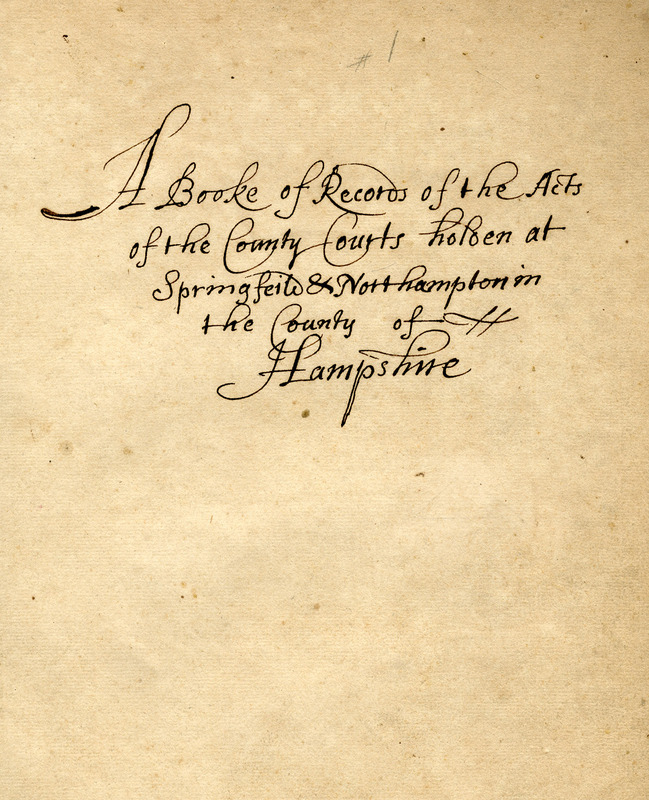 The Hampshire Council collection contains a dense record of county-level governance in western Massachusetts from the colonial period through the mid-twentieth century with extensive documentation of the actions of the County Commissioners, and before them the Court of Common Pleas and Court of General Sessions. Rich in documenting the development of the transportation infrastructure of western Massachusetts, the collection offers detailed information associated with the planning and construction of highways, canals, ferries, and railroads, but the early records offer a broad perspective on the evolution of the legal and cultural environment, touching on issues from disorderly conduct (e.g., fornication, Sabbath breaking) to the settlement of estates, local governance, public works, and politics. Because of the intensely local nature of the records, the collection offers some insight into the daily lives of women as well as men, Native Americans and African Americans as well as whites, rich and poor, and urban and rural. The collection is divided into four series: County Commissioners and Court Records, Dockets, Maps and Plans, and Microfilm. This finding aid contains only a preliminary listing of contents and will be added to as processing progresses. As materials are digitized, we will provide links to the online records through the inventory below. The records of the Inferior Court of Common Pleas, the Court of General Sessions for the Peace, and the Hampshire County Commissioners are a remarkable, continuous record of county-level governance in western Massachusetts for nearly three centuries. Until 1812, Hampshire County administered most of the western half of the Commonwealth, and the records are consequently broad, geographically and culturally. Beginning shortly after the end of King Phillips War, they document the establishment of political and cultural order during the late 17th century, the period of the Second Great Awakening, the Revolution, Shays Rebellion, and War of 1812. The content relates to all aspects of the operations of county-level administration, including licensure, building roads and infrastructure, and in early years, the record books document civil and occasionally criminal infractions. Until 1828, each bound volume contains the interspersed records of meetings of both the Court of General Sessions and Inferior Court of Common Pleas. When the Courts of General Sessions were abolished in Feb. 26, 1828, the corresponding volume records that the legislature "transferred the powers and duties lately rested in and exercised by" that court to the newly formed County Commissioners, and from that point onward, the volumes are restricted to the Hampshire County Commissioners, and are correspondingly narrower in scope. The dockets are comprised of filings relating to proceedings documented in the record books (Series 1). Consisting primarily, though not exclusively, of original letters and associated documents, these often provide greater detail than the record books. Overwhelmingly, the dockets center on road construction in the early years. The County Commissioners maintained working maps of the towns and counties to document the creation, extension, relocation, alteration, or discontinuance of county roads through the various towns, as well as similar maps for railroad routes (including lands taken and location of route), dams, and bridges. Each proposed action was accompanied by a map documenting the changes, usually a relatively detailed technical drawing with little embellishment. The Commissioners also maintained commercial maps and atlases of the county and towns. The vast majority of maps in the series date from the mid- to late-twentieth century, however most of the railroad maps correspond to an earlier period of expansion and extend back as far as the establishment of the first rail lines through the region. Dams and bridges are less well documented, although a series of reports on dam inspections between the 1920s and 1950s include valuable detail. A few items in the series are worthy of particular note, including a broadside proclamation from Governor James Bowdoin, Feb. 17, 1787, regarding persons who had been disqualified for taking part in Shays Rebellion; an early atlas containing manuscript maps of county highways (1759-1838); and two volumes relating to the reconstruction of Williamsburg after the Mill River flood of 1874, the Plan for a Proposed Dam at the Williamsburg Reservoir and Williamsburg Road Plans. Most of the maps are tightly rolled and many are in poor condition, embrittled, and often torn and chipped. All require special care in handling. In addition to microfilm of the volumes comprising Series 1, the collection includes microfilm of materials held elsewhere. Included are indexes to the county records, records of civil actions in the Superior Court (1856-1908), records of the Supreme Judicial Court (1797-1954), the Registry of Probate (1660-1820), a small sampling of records from the Registry of Deeds (1859-1860), and naturalization records (1849-1934). The records appear to have been filmed on more than one occasion and duplicate reels have not been inventoried. Includes lists of executions, 1716-1765. Manuscript maps depicting early roads in Hampshire County. Labeled vol. 1 (all that is present). Evans 20501. "Whereas by an act passed the sixteenth of February instant, entitled, 'An act describing the disqualifications, to which persons shall be subjected, which have been, or may be guilty of treason ... and to whom a pardon may be extended'... Given at the council chamber in Boston, this seventeenth day of February ... one thousand seven hundred and eighty-seven." Middlefield: Plan and elevation for a dam on Coles Brook for Virginia Lakeshore, Inc.
Massachusetts Central Railroad: Location in Hampshire County, Mass. New Haven and Northampton Company: Location of lands of the New Haven and Northampton Company, County of Hampshire, Mass. Inferior Court of Common Pleas: Maxwell, Sylvanua-Parsons, Curtis R.
When Hampshire County was dissolved in 1999, Massachusetts General Law 34B, S20(b), specified that all records of county roads were to be transferred to the Hampshire Council of Governments. In 2011, the Council permitted SCUA to provide care and access to the records. Processed by I. Eliot Wentworth, June 2012. View the Index to highway records in the Hampshire Council collection. Cite as: Hampshire Council of Governments Records (MS 704). Special Collections and University Archives, University of Massachusetts Amherst Libraries.